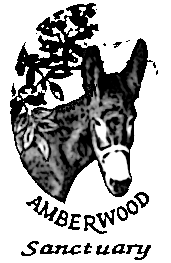 Amberwood Sanctuary:: Donkeys: Stupid/Stubborn? Not! 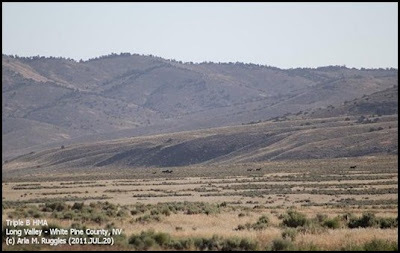 first day of the wild horse roundup at Triple B Complex in Nevada and reported that the Bureau of Land Management has made definite improvements in its roundup practices. But then, 15 days into the roundup, disturbing abuses of wild horse foals took place. Be sure to see both reports at the end of this post. Down through history, donkeys, along with snakes, rats, and many insects, have been given a bum rap for various reasons: misinformation, false assumptions, human-centered fallacies, preconceived notions, generalizations, insufficient information, ignorance, personal rationalizations, prejudice, acceptance of someone else’s opinion as fact, acceptance of consensus, and probably many more. 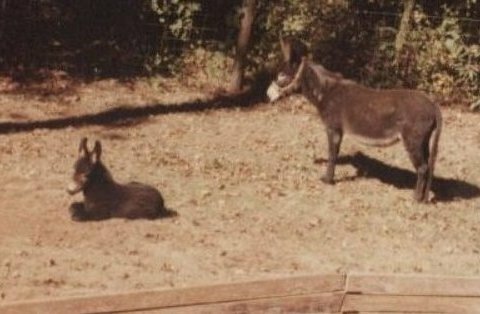 I am just beginning to learn a little more about snakes, rats, and insects, but I feel I am somewhat of an authority on donkeys, having loved them, cared for them, and lived closely with them for 34 years. We think they’re stubborn; they think they’re cautious. donkey: He wasn’t so inclined! grassrootshorse.com editor: The following report and photographs are by Arla M. Ruggles who has been out on the range for us and attended Day 1 of the Triple B wild horse roundup. In our role as advocates for better treatment of our wild herds, it often seems like only the mistakes and abuses are talked about. 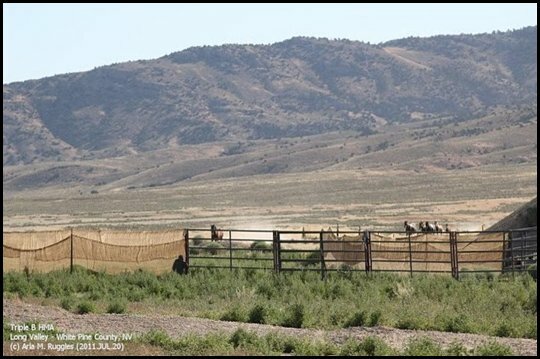 The worst aspects of wild horse management operations do need to be brought to light, AND we should be just as quick to recognize improvements as they occur. Today, it must be said that Sun J and BLM did an excellent job in all aspects of their gather operations, and every part of the process was carried out with professionalism and skill. performances at the Antelope Complex gather, early this past winter. Throughout the day, Josh held back from the running herds, and at one point, even fell back and allowed them to rest and regroup before continuing into the jute enclosure. None of the horses entering the trap appeared unduly stressed, and no lather appeared. Padded overhead rails are known to reduce injuries significantly. A few of the railings were missing pads, and this was also pointed out to the rep.
an excellent point of vantage for wranglers. Today’s trap setup was unique, in that the trap and sorting corrals were directly connected to short-term holding pens. 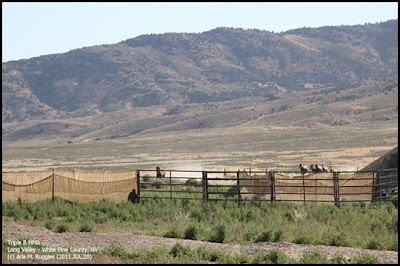 This eliminates one in a series of loading and unloading, as the horses will be taken directly to their destination in Gunnison, Utah. This not only reduces stress on the horses, it is economically advantageous. The pens were well supplied with fresh water and hay. A water truck from BLM Fire filled troughs and then encircled the pens with a swath of cooling spray to quell the dust. We noticed that the animals seemed undisturbed by the large truck driving around the pens, while workers on foot were frightening to them. 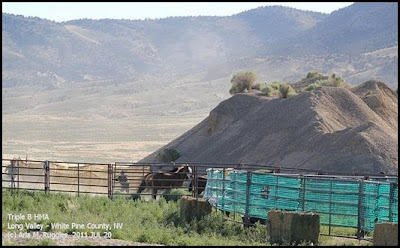 Given that this is a mining area, the horses are used to heavy vehicles rolling through their habitat. The sorting process was carried out quickly and efficiently and each group of animals settled down quickly after sorting. The four-wave gather brought in eight stallions, eight dry mares, two mares with foals, and two heavily pregnant mares, for a total of 22. At the end of the day’s gather operations, we were invited to approach the holding pens. 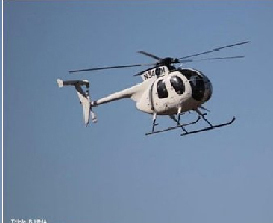 All animals were in very good condition, and no serious injuries were observed. 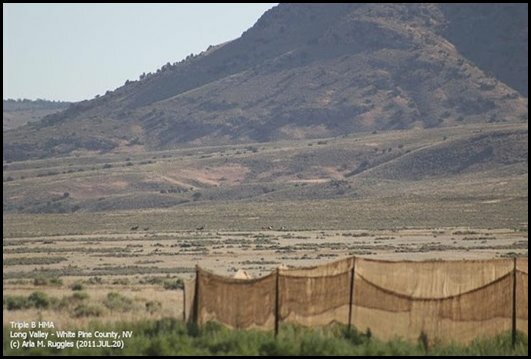 It is gratifying to note that cooperative efforts between advocates and BLM have brought about some improvements in the roundup process. We can be grateful for the horses’ sakes. Such progress in dialogue bodes well for continuing efforts in the struggle to achieve a healthy equine environment and an end to mass removals of horses from their native ranges. As the number of deaths increases of wild horse foals captured during the Triple B wild horse “gather” currently under way in Nevada, disturbing photographic evidence of abuse of the foals has been uncovered. A “gather” is the BLM’s euphemism for a roundup. 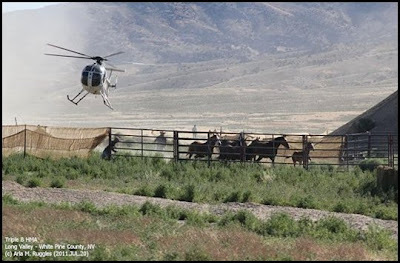 The photos come not from public observers witnessing the roundups but from the BLM itself and appear to have a connection to a video montage covering what transpired from August 4 - 6, taken by Deniz Bolbol of the American Wild Horse Preservation Campaign (AWHPC). 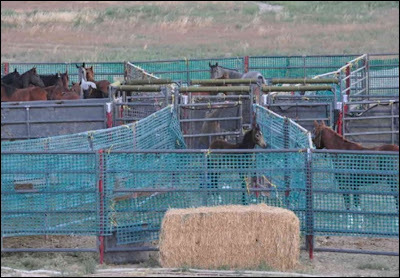 The video clearly showed foals being pushed, kicked, shoved, wrestled, and manhandled by the employees of the BLM’s contractor, Sun J, during trailer loading. 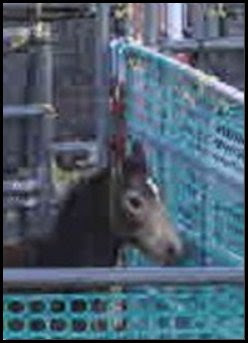 The footage taken for AWHPC and the American Society for the Prevention of Cruelty to Animals (ASPCA) shows the abusive trailer loading as well as the aggressive roping of an exhausted foal after being chased by five mounted wranglers. That documented abuse of foals is now joined by BLM’s own photograph taken on August 5, 2011, by BLM Nevada and posted on their Flickr page. 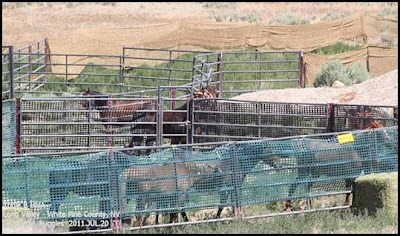 Bruce Thompson, wild horse and burro specialist, is the COR/PI for the Elko, Nevada, portion of the Triple B wild horse roundup, and he can be contacted at 775-753-0286. 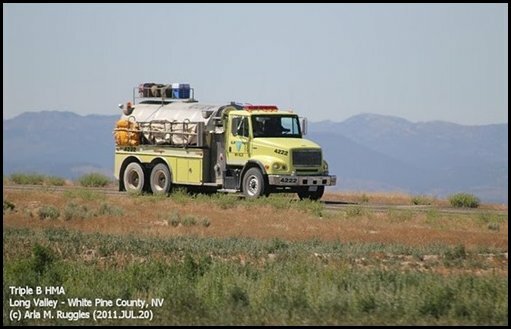 He reports to the Elko district manager, Ken Miller (775-753-0200), regarding his responsibilities as COR/PI. Ruth Thompson (775-289-1800) is the COR/PI for the Ely, Nevada, portion of the Triple B wild horse roundup. She reports to the Ely district manager, Gary Medlyn (775-289-1800). Dean Bolstad, deputy division chief, Wild Horse and Burro Program (775-861-6583). 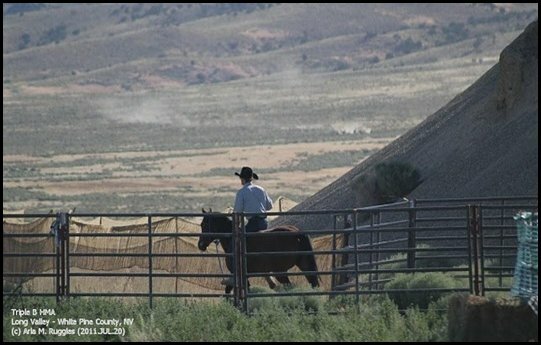 Please contact your congress people and ask that this roundup be stopped immediately and that a moratorium be placed on all wild horse and burro roundups until the necessary investigations into this program and this contractor’s personnel be conducted by an impartial and independent review team. This is our new workshop—almost complete. After 20 years, I will finally be able to get all the tools and equipment off my front and back porches and from inside my house! Below are “before” pictures of the old barn now being renovated. This is a big job. It looks pretty bad now, but wait till Bobby gets through with it.